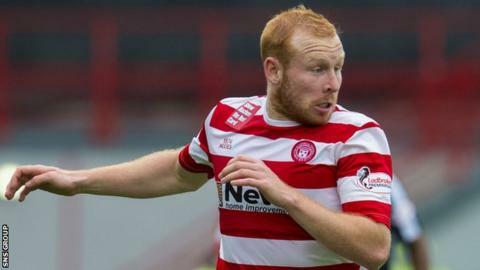 Ziggy Gordon will leave Hamilton at the end of the season with the gratitude and good wishes of Martin Canning. The 23-year-old full-back informed his manager that he intends to find a new club now that the Accies are assured of their top flight place for next season. "I think he has a couple of options that he wants to go and explore," said player-boss Canning. "I will be the first to shake his hand and thank him for everything he has done for the club." Gordon made his first team debut in February 2011 and has been a regular fixture in the side since season 2012-13. He will move on as a free agent. "Ziggy has been here since he was a young kid and been great for us, he has been fantastic," added Canning. "He is the hungriest wee guy you will get, determined to do well for himself. He puts everything into every game and training session. "Whether it is a training session or a game, he would tackle his granny, he is that type of player. "So I have nothing but positives to say about him. People move on, it is part of football, and we will wish him all the best if that is the case."